Even though we all try to avoid sun damage, it still happens to the best of us occasionally. 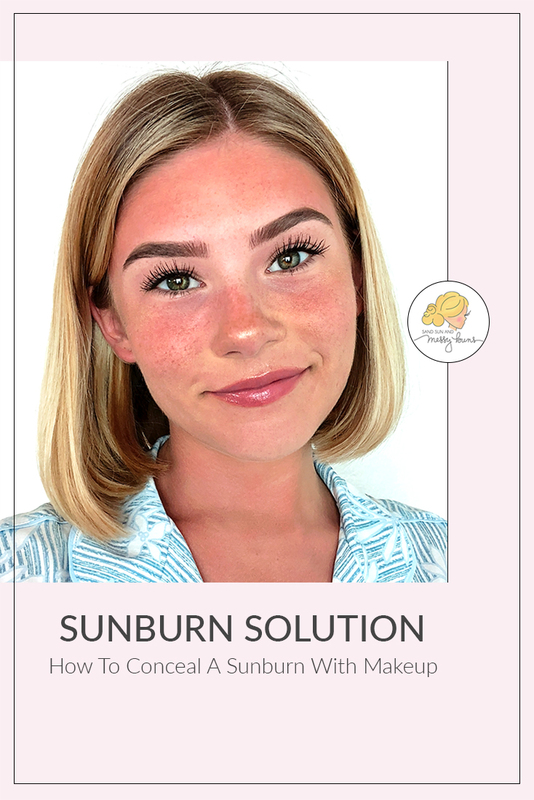 If you find yourself sporting a fiery pink glow after a long day at the beach, here's how to cover up sunburn with makeup. I've also included my favorite tip to help quickly heal a burn and turn it tan overnight! If you find my sunburn tips helpful, please share this image on Pinterest. Before I go any further, I want to repeat something I always mention here on the blog: Always wear a broad spectrum sunscreen with an SPF of 30+. It's the best thing you can do for your skin! I wore sunscreen the day I got burned in my video below, but then I fell asleep and didn't reapply like I should have. NOTE: Tarte's Swamp Queen palette was limited edition and is no longer available. If they ever re-release it, I recommend putting it in your cart immediately. It's my favorite palette I've ever owned. The Carli Bybel palette is a good dupe for the highlighter. Apply a green tea face mask to skin to soothe and encourage faster healing. Green tea contains powerful anti-oxidants that help heal and protect skin from environmental damage. Thoroughly apply apple cider vinegar using a cotton ball. TIP: Buy apple cider vinegar *with the mother*. It'll be listed on the packaging (or just get the one I use to be sure). It's always worked best for me! Apply a broad spectrum sunscreen with an SPF 30+ if you plan to spend any time at all outdoors. Be sure to cover your neck and ears! Moisturize thoroughly with a cream (preferred since it's more moisturizing) or lotion. Apply bronzer to help cancel out some of the red undertones. That's it! I hope these tips for covering a sunburn are helpful. Remember not to skimp on the sunscreen! Find a cute hat and wear it anytime you're venturing out with skin that's already showing signs of sun damage. This post came at the right time! I just came back from a trip and I got sunburned all over just spending half a day outside. I’ve never had any luck with green concealers but I might just have to give them a go again to cover up the redness. Awesome tips!! Haha I wish I had this tutorial a couple weeks ago when my entire side was burned. I have also used some makeup to cover up sunburns on other parts of my body, not just my face! Thanks for this! This is a very useful post for me because I’m Irish, which means I never tan! I burn and then I peel and my sunburns are always hard to cover up! Pinning!